WARNING: Though this medication often gives great benefits to people with irregular heartbeat, it may infrequently worsen an irregular heartbeat or cause serious (sometimes fatal) side effects. When starting treatment with this drug, your doctor may have you stay in the hospital for proper monitoring. Amiodarone may take 2 weeks or longer to have an effect in your body. Also, this drug stays in your body for weeks to months, even after you are no longer taking it. Therefore, serious side effects may occur weeks to months after taking amiodarone. Serious side effects may include lung or liver problems. Tell your doctor immediately if you notice any symptoms of lung or liver problems such as cough, shortness of breath, chest pain, coughing up blood, persistent nausea/vomiting, dark urine, severe stomach/abdominal pain, or yellowing eyes/skin. USES: This medication is used to treat certain types of serious (possibly fatal) irregular heartbeat (such as persistent ventricular fibrillation/tachycardia). It is used to restore normal heart rhythm and maintain a regular, steady heartbeat. Amiodarone is known as an anti-arrhythmic drug. It works by blocking certain electrical signals in the heart that can cause an irregular heartbeat. HOW TO USE: Read the Medication Guide provided by your pharmacist before you start using amiodarone and each time you get a refill. If you have any questions, consult your doctor or pharmacist. Take this medication by mouth, usually once or twice daily or as directed by your doctor. You may take this medication with or without food, but it is important to choose one way and take this medication the same way with every dose. Avoid eating grapefruit or drinking grapefruit juice while using this medication unless your doctor instructs you otherwise. Grapefruit can increase the amount of this medication in your bloodstream. Consult your doctor or pharmacist for more details. The dosage is based on your medical condition and response to treatment. Your doctor may direct you to start this medication at a higher dose and gradually decrease your dose. Follow your doctor's instructions carefully. Do not stop taking this medication or change the dose without first consulting your doctor. Tell your doctor if your condition does not improve or if it worsens. SIDE EFFECTS: See also Warning section. Nausea, vomiting, constipation, loss of appetite, shaking, or tiredness may occur. If any of these effects persist or worsen, tell your doctor promptly. Remember that your doctor has prescribed this medication because he or she has judged that the benefit to you is greater than the risk of side effects. Many people using this medication do not have serious side effects. Tell your doctor immediately if any of these unlikely but serious side effects occur: easy bruising/bleeding, loss of coordination, tingling/numbness of the hands or feet, uncontrolled movements, new or worsening symptoms of heart failure (such as ankle/leg swelling, increased tiredness, increased shortness of breath when lying down). Seek immediate medical attention if any of these rare but serious side effects occur: faster/slower/more irregular heartbeat, severe dizziness, fainting. Amiodarone may infrequently cause thyroid problems. Either low thyroid function or overactive thyroid function may occur. Tell your doctor immediately if you develop any symptoms of low or overactive thyroid, including cold or heat intolerance, unexplained weight loss/gain, thinning hair, unusual sweating, nervousness, irritability, restlessness, or lump/growth in the front of the neck (goiter). This drug may cause your skin to be more sensitive to the sun. With long-term treatment, you may infrequently develop blue-gray color of the skin. This effect is not harmful and color may return to normal after the drug is stopped. Avoid prolonged sun exposure to help prevent this effect. (See also Precautions section.) This drug may infrequently cause vision changes. Very rarely, cases of permanent blindness have been reported. Tell your doctor immediately if you develop any vision changes (such as seeing halos or blurred vision). A very serious allergic reaction to this drug is rare. However, seek immediate medical attention if you notice any symptoms of a serious allergic reaction, including: rash, itching/swelling (especially of the face/tongue/throat), severe dizziness, trouble breathing. This is not a complete list of possible side effects. If you notice other effects not listed above, contact your doctor or pharmacist. In the US - Call your doctor for medical advice about side effects. You may report side effects to FDA at 1-800-FDA-1088. In Canada - Call your doctor for medical advice about side effects. You may report side effects to Health Canada at 1-866-234-2345. 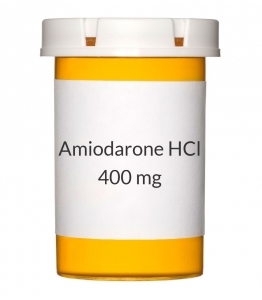 PRECAUTIONS: Before taking amiodarone, tell your doctor or pharmacist if you are allergic to it; or to iodine; or if you have any other allergies. This product may contain inactive ingredients, which can cause allergic reactions or other problems. Talk to your pharmacist for more details. Before using this medication, tell your doctor or pharmacist your medical history, especially of: liver disease, lung disease, thyroid problems. This drug may make you dizzy. Do not drive, use machinery, or do any activity that requires alertness until you are sure you can perform such activities safely. Limit alcoholic beverages. This medication may make you more sensitive to the sun. Avoid prolonged sun exposure, tanning booths, and sunlamps. Use a sunscreen and wear protective clothing when outdoors. Before having surgery, tell your doctors or dentist about all the products you use (including prescription drugs, nonprescription drugs, and herbal products). Amiodarone may cause a condition that affects the heart rhythm (QT prolongation). QT prolongation can infrequently result in serious (rarely fatal) fast/irregular heartbeat and other symptoms (such as severe dizziness, fainting) that require immediate medical attention. The risk of QT prolongation may be increased if you have certain medical conditions or are taking other drugs that may affect the heart rhythm (see also Drug Interactions section). Before using amiodarone, tell your doctor or pharmacist if you have any of the following conditions: certain heart problems (heart failure, slow heartbeat, QT prolongation in the EKG), family history of certain heart problems (QT prolongation in the EKG, sudden cardiac death). Low levels of potassium or magnesium in the blood may also increase your risk of QT prolongation. This risk may increase if you use certain drugs (such as diuretics/"water pills") or if you have conditions such as severe sweating, diarrhea, or vomiting. Talk to your doctor about using amiodarone safely. This medication is not recommended for use during pregnancy. It may harm an unborn baby. Consult your doctor for more details. Amiodarone passes into breast milk and may have undesirable effects on a nursing infant. Breast-feeding is not recommended while using this drug. DRUG INTERACTIONS: See also How to Use section. Drug interactions may change how your medications work or increase your risk for serious side effects. This document does not contain all possible drug interactions. Keep a list of all the products you use (including prescription/nonprescription drugs and herbal products) and share it with your doctor and pharmacist. Do not start, stop, or change the dosage of any medicines without your doctor's approval. A product that may interact with this drug is: fingolimod. Many drugs besides amiodarone may affect the heart rhythm (QT prolongation), including dofetilide, pimozide, procainamide, quinidine, sotalol, macrolide antibiotics (such as clarithromycin, erythromycin), quinolone antibiotics (such as levofloxacin), among others. (See also Precautions section.) Other medications can affect the removal of amiodarone from your body, which may affect how amiodarone works. Examples include azole antifungals (such as itraconazole), cimetidine, protease inhibitors (such as indinavir), rifamycins (such as rifampin), St. John's wort, among others. Amiodarone can slow down the removal of other medications from your body, which may affect how they work. Examples of affected drugs include beta blockers (such as propranolol), calcium channel blockers (such as diltiazem, verapamil), clopidogrel, cyclosporine, digoxin, phenytoin, certain "statin" drugs (atorvastatin, lovastatin, simvastatin), trazodone, warfarin, among others. OVERDOSE: If overdose is suspected, contact your local poison control center or emergency room immediately. US residents can call the US National Poison Hotline at 1-800-222-1222. Canada residents can call a provincial poison control center. Symptoms of overdose may include: weakness, severe dizziness, very slow heartbeat, fainting. NOTES: Do not share this medication with others. Laboratory and/or medical tests (such as EKG, chest X-rays, lung tests, liver tests, thyroid tests, eye exams) should be performed periodically to monitor your progress or check for side effects. Consult your doctor for more details. Keep all laboratory and medical appointments.